NJ 5072 0714. Lying in a plantation is a possible hut circle of about 16m internal diameter. It is turf-covered but there may be a stone bank; a few stones stand on the bank. There is a large flat stone in the centre, and quartz pebbles are present within the circle. This hut-circle survives on a moderate SW-facing slope in a forestry plantation at an altitude of 340m OD. (Information from Ken Cooper, Tarland). circle and other worked flint and quartz pieces were recovered across the extended area. Two further monuments were identified during the fieldwalk: a hillside cairn (NJ 5106 0725) and a second circular feature (NJ 5099 0706). This recumbent stone circle is situated in rough, gently sloping ground, on the crest of a high S-facing scarp commanding extensive views over the Howe of Cromar. Little is left of the stone circle, but the massive ring-cairn which it once enclosed is comparatively well-preserved. Nevertheless, the stone circle is recalled in a small broken orthostat on the NE (4), a broken orthostat displaced within the ring-cairn's interior (A), and in two sockets either side of a broad shallow hollow on the SW (1, 2 and 3). The latter constitutes almost all that is left of the recumbent setting - although three large fragments probably deriving from each of these stones have been identified close-by (1a, 2a and 3). 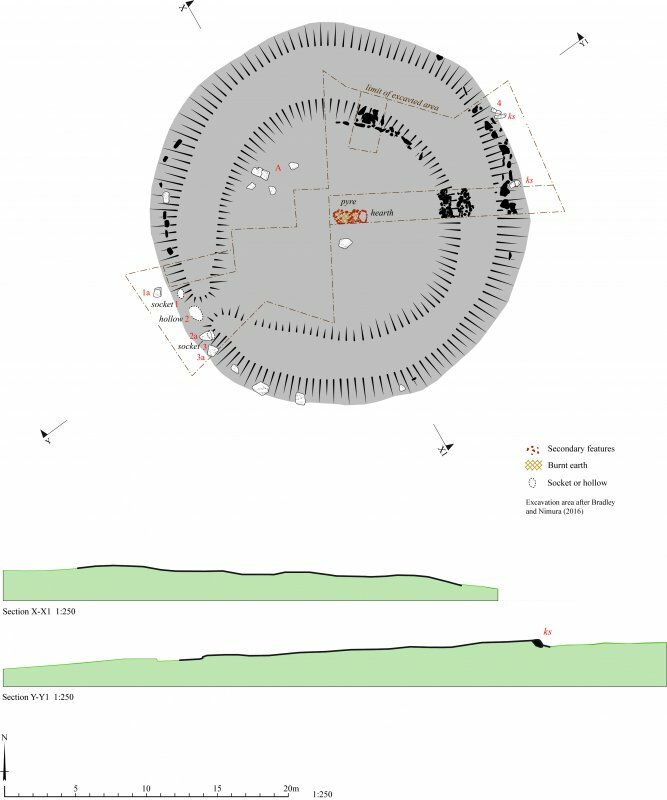 The circle measures about 26m in diameter, which reflects the overall diameter of the ring-cairn, as the orthostats appear to have been erected at the edge of a very narrow cobbled strip immediately against the latter's outer kerb. They are likely to have been roughly graded in height, as the NE orthostat (4) is short in comparison to its displaced companion (A), while the surviving fragments from the recumbent setting are relatively large and chunky (1a, 2a, 3a). It appears that the stones of the ring may all have been a grey magnatite, in contrast to the recumbent stone which is a pink felsite. The monument is oriented SW (centre line azimuth: 237 degrees) and, unusually, the NE stone (4) is situated on the same axis. The ring-cairn is disfigured by a series of parallel grooves produced by forestry ploughing in preparation for replanting. It is polygonal on plan and varies between 7m thick and 0.7m high on the NE and 4m thick and 0.5m high on the SW, where there is a gap up to 2m wide immediately behind the former position of the recumbent. There is a near continuous outer kerb of slabs and boulders on the W, while individual kerbstones are visible elsewhere about its circuit and others were found in excavation on the ENE (see below). There is no evidence that these were graded in size and no kerbstones were visible within the interior before the turf was removed on the N. The central court, which measures up to 17m in diameter, is partly filled with stones and boulders. 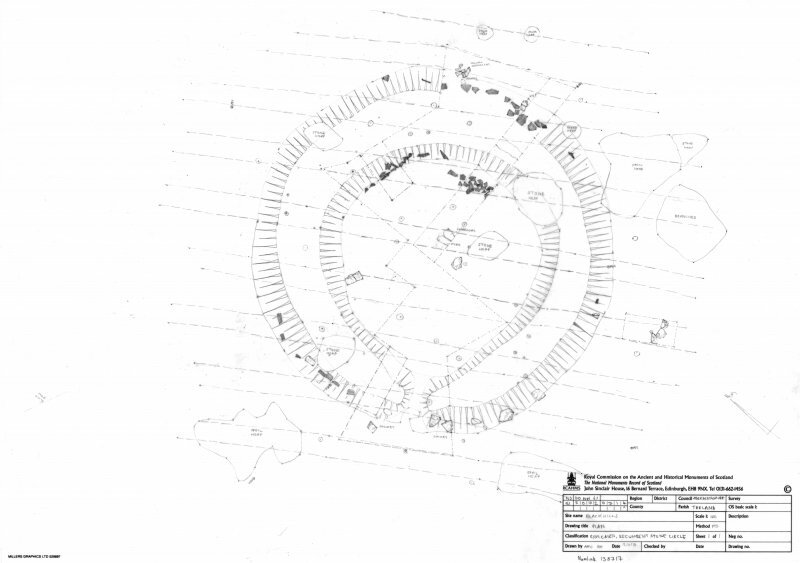 Although originally classified as a possible hut-circle (Cooper 1998), Bradley and Clarke's limited excavations in 2013 not only identified the remains of this complex multi-period monument as those of a recumbent stone circle, but also provided some insight into its sequence of construction. The earliest element, dating to the Early Bronze Age, was a circular stone wall, characterised by a rubble core measuring 2.4m thick and 0.4m high, with a crest that may have been stepped. This structure was subsequently augmented with an outer bank of rubble, thickest and highest on the NE and again possibly stepped, which was delimited externally by kerbstones firmly wedged either side by boulders. At this point the succession becomes less insecure, but the whole of this structure was covered with boulders filling the central court to the top of the inner kerb and the recumbent stone circle was introduced. 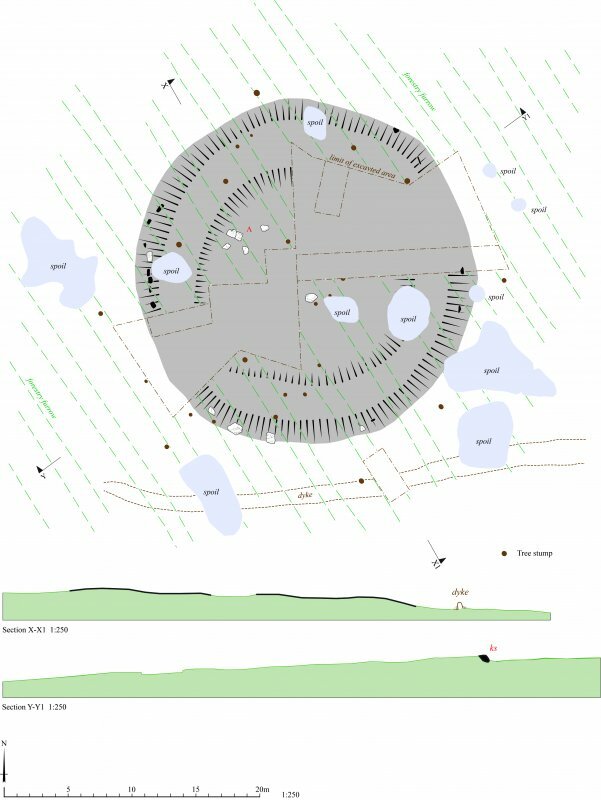 Interference at the centre of the monument occurred in the Middle to Late Bronze Age, with the insertion of two small, charcoal-filled pits lined with boulders, situated immediately E of a scorched area of the natural ground surface associated with the debris from a pyre. This consisted of burnt soil intermixed with oak and alder charcoal, together with human bone. Each of these features was covered by a layer of small boulders before the whole of the court was later sealed beneath a scatter of broken quartz, which increased in density towards the centre and SW.
Finds included a fragment of Beaker from the old ground surface beneath the monument and five flint pieces from its surface. Subsequent analysis showed that the cremated bone retrieved from one of the charcoal-filled pits and from amongst the pyre debris probably represented in each case only one individual. The earliest of a series of radiocarbon dates from charcoal on the old ground surface beneath the ring-cairn are thought to predate the monument (2460-2200 BC), but others may more closely reflect its initial construction (2290-1980 BC). The boulder capping was introduced at some point after the early 3rd millennium BC, the secondary pits before the mid-late 2nd millennium BC (1500-1300), while the final capping of quartz was in place after the end of the 2nd millennium BC. Visited by RCAHMS, Survey and Recording (ATW, AMcC, GFG), 12 November 2013. NJ 5072 0714 The site was first identified in 1998 when it was covered by trees and was provisionally interpreted as the remains of a roundhouse. When the forest was replanted in 2012 the earthwork was accidentally damaged, leading to its partial excavation. At the same time a local inhabitant recalled that it had originally included a setting of standing stones which were removed in the 1940s, long before their archaeological significance was recognised. The 2013 excavation had the aims of diagnosing the original form of the monument and collecting dating evidence. It is clear that the remains were not those of a domestic building but belonged to a substantial ring cairn with well preserved inner and outer kerbs, the latter of which had been robbed. The entire monument had been constructed out of blocks of local stone. A fallen monolith was identified on its NE side, and towards the SW were two substantial sockets from which standing stones seem to have been removed. They flanked a shallow oval hollow of suitable size to have held the base of a recumbent stone. 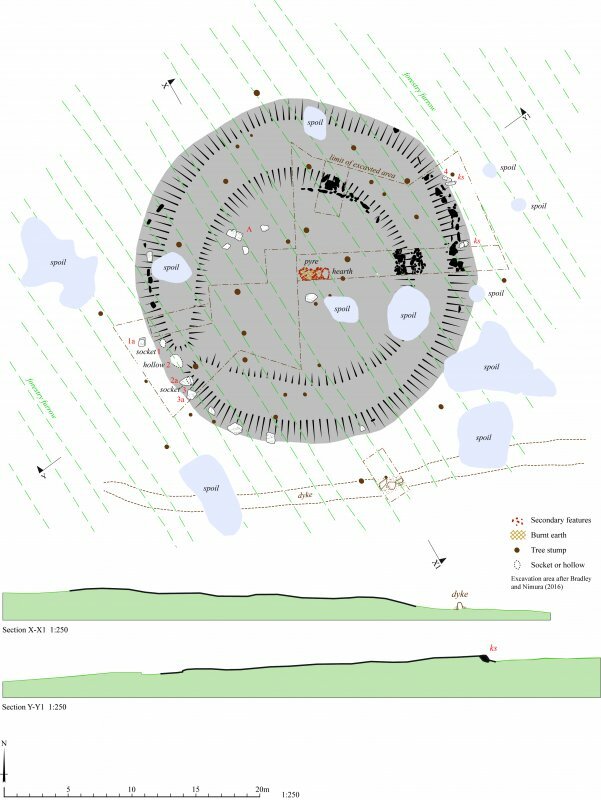 Comparison with the neighbouring monument of Tomnaverie, excavated and restored in 1999–2000, suggests that the structure at Blackhills was a previously unknown recumbent stone circle. It was one of the largest monuments of this type. Its position overlooking the Howe of Cromar also makes it one of the highest. If the ring cairn was unusually massive, the stone circle immediately outside it may have been of more modest proportions. Radiocarbon samples were collected from the land surface sealed by the monument. The structure had a series of unusual features. The cairn was significantly larger on the NE side and may not have had a kerb towards the SW. The widest and highest part of the bank of rubble provided evidence of internal walling, supporting a flight of shallow ‘steps’, surfaced by flat slabs. They may have accommodated an audience looking across the recumbent stone toward the distant flank of Lochnagar. The stone circles at Tomnaverie and Waulkmill are also visible from this position. In the reverse direction the monument was built at the point where someone leaving the lower ground of the Howe would first see the summit of Mither Tap. A significant quantity of worked quartz extended outwards from the monument and was recorded in the forestry trenches by a team led by Moyra Simon and Jane Summers. In a secondary phase, the original monument at Blackhills was covered by a uniform deposit of rounded boulders collected from glacial deposits nearby. In the centre of the site three features were excavated through this material. Two contained dense deposits of charcoal, whilst a third also included a quantity of cremated human bone. In this case the surface of the hillside was scorched, suggesting that it was in situ cremation pyre. These structures were covered by a thin layer of stones before the entire interior of the ring cairn was overlain by a dense deposit of 13,000 pieces of worked and broken quartz. Radiocarbon dating should provide a terminus post quem for the initial filling of the ring cairn and for the secondary deposits in the centre of the monument. In view of the significance of the site, the structure and the area immediately around it have been taken out of forestry and are to be preserved in an area of grazed grassland.